This product is no longer available as a catalog purchase. Contact ATS to discuss your ongoing projects. SSP-SAP is a conjugation of saporin and SSP, the Sar9, Met(O2)11 analog of Substance P. These two amino acid replacements are at two sites of digestion by tissue proteases (there is a third that is still in the analog, so it does eventually get degraded). Since the targeting agent is, of course, necessary for the cytotoxic activity, SSP-SAP will diffuse farther, and thus hit more target cells. This specific analog of SP-saporin resists peptidase digestion, allowing a greater diffusion from the injection site before its metabolism. SSP-SAP eliminates cells expressing the Substance P (NK-1) receptor. 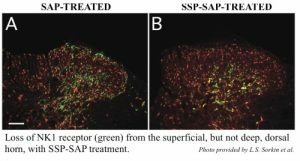 Behaviors associated with pain perception are greatly affected by the injection of SSP-SAP into the spinal cord of rats. It is not suitable for retrograde transport. SSP-SAP eliminates cells expressing the Substance P (NK-1) receptor. All other cells are left untouched, even when they are the predominant cell type. This specific analog of SP-saporin resists peptidase digestion, allowing a greater diffusion from the injection site before its metabolism. Not suitable for retrograde transport.